Yesterday marked the 200-day mark until Brett and I embark on our first Disney Cruise. Not only is this our first cruise, but we will be taking it on Disney Cruise Line’s newest ship – the Disney Dream. My dear friend (and fellow Disney food lover), AJ Wolfe from DisneyFoodBlog.com had the awesome chance to spend some – albeit very short – time on the ship. Today is part one of two looking at the food options on this spectacular ship. In January I had the lucky opportunity to spend two days eating on the Disney Dream Cruise Ship, the Disney Cruise Line’s newest — and biggest — vessel! And when I say “spend two days eating,” I mean it. I’m pretty sure I always had a fork in my hand! The food options seem endless on the Dream, and with five full-service restaurants, a breezy buffet, 24-hour room service, and plenty of grab-and-go counter service options, they pretty much are. Here’s a little overview of how to feed your face at sea! The Disney Cruise Line assigns dining arrangements via a rotational dining system. This means that guests are assigned to dine at one of the main dining locations each evening, and they’ll “rotate” through the restaurants throughout their cruise. This way, you get to experience all of the main dining options on the ship! Best of all, your attentive waitstaff rotates with you. The most formal of the three main dining locations, Royal Palace is decked out in marble and velvet — ideal for a princess and her court! Dine here on escargot and spinach souffle, roasted wild boar or mushroom pasta, and Grand Marnier Souffle or peanut butter mousse! Of course, those are just a few suggestions — the menu is much broader for different tastes and palates! The surroundings are as wondrous as the food! This Versailles-inspired restaurant transforms from day to night during your meal! Delicious menu options include North Atlantic Lobster Ravioli as an appetizer, Roasted Pork tenderloin seasoned with smoked salt for your entrée and Banana Foster sundae or strawberry cheesecake for dessert. 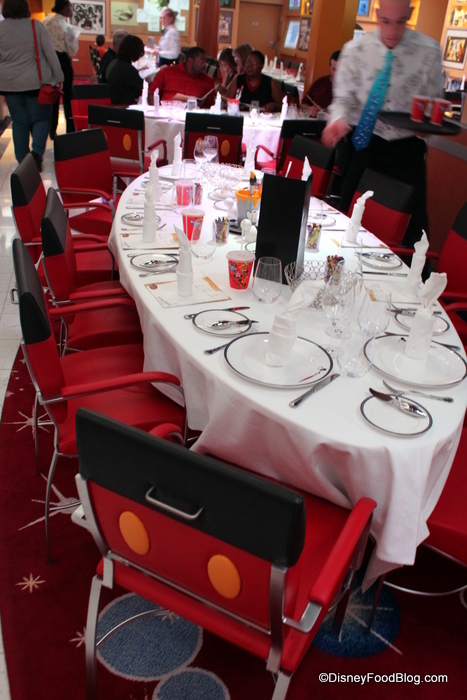 A whimsical dining room whisks you away at Animator's Palate aboard the Disney Dream. You may know this restaurant from the Disney Wonder and Disney Magic ships, however aboard the Disney Dream – it’s been plussed by the Imagineers. With a Finding Nemo theme, you’ll even get to meet that crazy dude, Crush! Oh, and there’s food too. 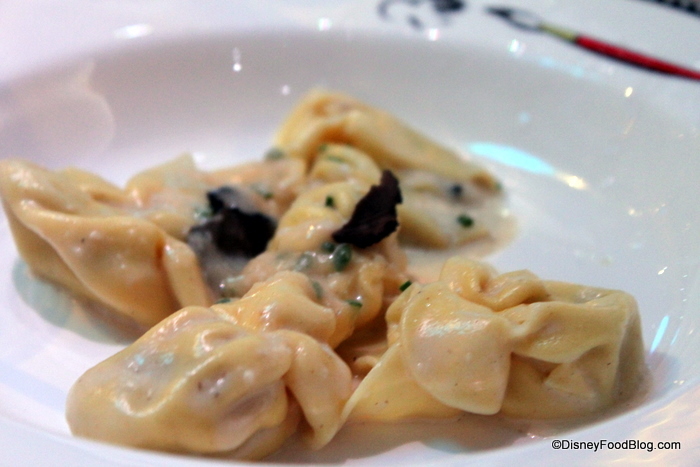 I highly recommend the Black Truffle Pasta Purseittes! One of the greatest conveniences (okay, splurges!!) of cruising is the 24-hour room service. The All Hands On Deck cheese platter and yummy BLT sandwiches are very popular. Hint: Order cookies for a bed time snack! 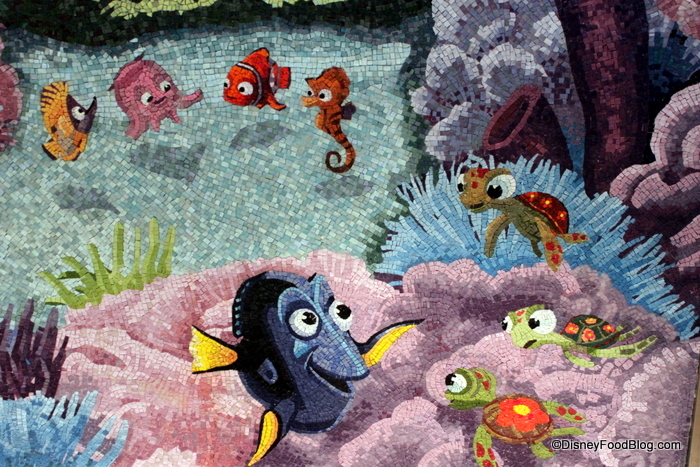 Mural art from Disney/Pixar's "Finding Nemo" adorns Cabanas on the Dream. Located Aft on Deck 11, the large windows allow cruisers to enjoy a continuous view of the ocean with indoor and outdoor tables. Cabanas serves a buffet for breakfast and lunch. It becomes a walk-in, table-service restaurant for dinner in your casual attire. Cabanas offers food stations rather than a long buffet line as seen on the earlier Disney ships. We will have part two of AJ’s dining adventures aboard Disney’s newest vessel on Saturday. She digs in to dishes at the Dream’s adults-only venues and counter service restaurants as well as Disney’s private island, Castaway Cay, in the Caribbean. See you real soon! This entry was posted in Disney, Disney World and tagged AJ Wolfe, Animator's Palate, aqua duck, Bahamas, banana foster, buffets, cartoons, Castaway Cay, cheesecake, Cruise lines, desserts, Disney Drea, Disney Food Blog, duck, Enchanted Garden, escargot, Finding Nemo, food, Mickey Mouse, movies, Pixar, Remy, rotational dining, Royal Palace, water coaster by Christina. Bookmark the permalink.